To create a booklet and 3 posters (as part of a poster series) for The Bernard and Anne Spitzer School of Architecture at CCNY. The theme for the series will be decided by you based on your research. It could be inspired by an interview, essay, or written publication about the architect and his/her work. This fictional lectures series will take place as part of a 3-day lecture series in the Fall of 2019. The exact dates are up to you. credits to the host, and sponsors of the lecture series. Pg 6-9 — Interview, essay, or written publication about the architect. Pg 10-13 — Selected works by the architect. No photography is allowed. If you are a photographer and would like to use your own images, you must run the images by me first. You can use a maximum of 4 colors—e.g. black, white, X, and Y. You can use a maximum of two typefaces. The architect must be alive and practicing. Use this as a starting point for your research. First Draft of the 3 posters and booklet. We'll discuss the balance of form and function in your design. In order to get the best feedback you must have all your content (text and images) ready to go. Second Draft of the 3 posters and booklet. We'll discuss the underlying structure (grid and style) that will make the posters and brochure work as a cohesive design system. In order to get the best feedback you must have all your work as close to the final stage as possible. Bring your final draft of the posters and the booklet for critique by a visiting guest critic. We will begin promptly at 2:30pm so be on time and ready to present. Each student will get roughly 5-8 minutes. We'll do critiques in groups. Make sure to show up on time, sign-up, and be ready to present. At the beginning of each class, please pin up your posters in sequential order and have your booklet printed and assembled. Export and submit PDF files of your work. I won't accept InDesign files. If you're having technical difficulties first google it, then ask a classmate, a lab assistant, and last but not least, ask me. First Draft is V1.00, Second Draft is V2.00, Critique is V3.00, and Final is V4.00. Please add a .01 for each revision that you send me throughout the week if you want extra feedback. Find an architect for your project. Write his/her name on the board as well as a comment on the blog to avoid duplicates. When you talk about your architect during critique be ready to introduce their work. Please write a concise paragraph or two that answers these 6 questions and post them as comments on this blog. Be ready to introduce your work by answering those questions during critique. Where are they from and where do they practice? What attracted you to their work and practice? What is the theme of the lecture series (your project)? How did you convey that theme through your work? What typefaces did you choose and why? Condense your 3 type specimens into one 16-page type specimen and three specimen sheet inserts. The 16-page (or more) version should show the typeface's functional and graphic qualities as well as the experimental possibilities of it. The specimen sheet inserts can be any size as long as it fits (folded or unfolded) inside your type specimen. Think about the experience of the person going through your type specimen and choose the placement according to that. We'll have group critiques from 2:30-4:30pm. Please sign up for a group at the beginning of the class. I'll be around from 2:00-2:30pm to answer any questions you may have about the homework, software, etc. These mini-sites are online interactive type specimens for inspiration. One 16-page version of your type specimen and three specimen sheet inserts. Make you use the checklist at the end of this blog entry. Email a copy of your Type Specimen PDF to you Type Crit Buddies and CC me on that email. If you don’t know what CCing someone means, here’s a useful explanation. According to your research, what kind of typography was your typeface designed for? Please explain. According to your research, what problems was your typeface trying to solve (if any) through its design according to the designer? What features of the typeface do you like or dislike? Why? What were some of the typeface features that you emphasized on your type specimen? How was your experience working with the typeface? Was it easy or difficult, please explain why you think you had that experience. Here's a basic email template to make you look professional and make your life easier. Feel free to change things but make sure your emails are polite and concise. Please find attached my Type specimen. Reply to the email thread and provide feedback to your two Type Crit Buddies. Don’t forget to CC me. Is the cover clear, legible, and intriguing? Does it have a clear hierarchy? If not, what in specific feels unclear, illegible (perhaps not truly illegible but legibility could be improved), or uninteresting (this can be both objective and subjective)? Did the pages after the cover have a consistent style and tone? Did the cover set the right amount of expectations for the reader? What were your expectations from the cover and did the following pages met them? Was the type specimen easy to navigate? What are some successful pages or spreads? Why? Talk about of pacing, continuity, hierarchy, and composition. What are some pages or spreads that could be improved and why do you think they need improvement? Talk about of pacing, continuity, hierarchy, and composition. Are there kerning issues, line-height issues, orphans, widows, hanging punctuation, or typos that the designer might have missed? Please list them out. Is everything correctly and appropriately labeled? In general, what was the most interesting and exciting part of specimen and what did you learn about your Type Crit buddy’s typeface. Please don't forget to CC me on all the critique email exchanges. I may not be able to comment throughout the week but will check to make sure that everyone did their work, was polite, and helpful. You're not responsible to critique work that was not received on time and neither are you responsible for people's missing feedback. You’re responsible of making sure the PDF file is attached to your email and obtaining your Type Crit Buddy’s email. Make sure you read Mitch Goldstein's How to Crit guide. Here’s the list of buddies. Each one of you is responsible for giving feedback to two of your classmates. Please be kind and helpful! In this project you will create a type specimen that shows off the formal and graphic qualities of a typeface of your choice. After using only Helvetica and Minion for most of the semester, you probably have a more informed idea on the strengths and weaknesses of both typefaces. However, so far we’ve been only scratching the surface. The goal of this project is for you to get acquainted with a different typeface by learning about its history and using it extensively. Design and produce a 16-page type specimen with additional type specimen sheet inserts. A type specimen is a booklet that demonstrates the range of a typeface, applied to headlines and text in a variety of sizes. Each variation of the typeface should be labelled on the page. Type specimens have existed for centuries to help designers pick a font for a project. Type specimens today can be wildly flamboyant or classical in their approach. See the Resources section below. Choose a typeface for your project that has a substantial number of styles, such as Univers, Helvetica, Caslon, Baskerville, Garamond, Futura, or Bodoni for example. Look at a variety of typefaces before you choose one, and be sure that you have access to a good “cut” of the face (a full type family). I must approve of your choice. Gather text for your project by researching about your typeface either online or at the library. Make sure to check out the Resources section on this blog entry. As a starting point, you must fill out the form below before the end of class and use that information on your type specimen. Feel free to revise and expand that information on your type specimen. I expect you to know this information whenever we discuss your specimen during critiques. Write a brief historical/factual description of the typeface. Please don't forget to cite your sources. All the information from your in-class research is required. You are welcomed to revise and expand your research during the week. For all other content, you're free to use any piece of literature that is under a Creative Commons license. Make sure to check out Project Gutenberg and other links on the Resources section of this blog entry. Size: 5 x 7 inches (10 x 7 inches spread) or 5 x 5 inches (10 x 5 inches spread). You may choose either one of those two sizes for all versions of your type specimen. You must use Master Pages to set up your grids (columns, rows, and baseline grid) as well as page numbers and any other relevant information. You must offset your text boxes to leading and align your text to the baseline grid. See Week 5 HW settings. You must have a cover page, colophon, and a table of contents in your total page count. You must use text and paragraph styles. You are only allowed to use black and white—gradients, other colors, transparency, or gray values are not allowed. The type family must have more than 4 styles and must include obliques or italics. Binding: Staple Saddle Stitch (this method requires back-to-back printing). Week 8 (in-class): First draft of the type specimen. Use the content that you submitted on the Research form and the word "Hamburgefontsiv" set on your typeface in every weight and style in which it is available. Week 9: Three 8-page versions of your type specimen (formal, graphic, and experimental). Week 10: One 16-page version of your type specimen and three type specimen sheet inserts. Week 11: Revised and final version of your 16-page type specimen with three type specimen sheet inserts. Bring 3 printed and assembled Type Specimens — 8 pages each. This version focuses on function over form. Make a type specimen that shows the typeface's formal qualities. Establishing a concise grid, a clear hierarchy, a balanced layout, a clarity of intention will make this design successful. In order to get you in the right mindset, think of this: you're trying to sell this typeface to a person who is looking for performance. This person is a Creative Director, has a refined visual taste and years of design experience. You're trying to show them how this typeface works in different typographic scenarios. Whether the typeface works best in large headlines or small lines of text. It’s you job to figure out, through testing, how to make your typeface looks its best. This version focuses on form over function. Make a type specimen that shows the typeface's more graphic qualities. All of the tip for success from version 1 apply to this version. In order to get you in the right mindset, think of this: you're trying to sell this typeface to a person who is looking for something unique. This person is a Senior Designer and will be working directly with the typeface everyday. They’re looking for something that is not only a workhorse but can also possibly shine on a book cover, if necessary but not a requirement. Showing that the typeface is versatile but also has charm—loud and quiet moments—will make this type specimen successful. Typeface anatomy spread showing key characters of the typeface and highlighting important details. This version focuses on personal expression. Make a type specimen that shows your taste as a designer. All of the tip for success from version 1 and 2 apply to this. In order to get you in the right mindset, think of this: The Creative Director and Senior Designer are almost sold on the typeface. However, they still want to see how far the typeface can be pushed (graphically speaking) before it stops working. Your task is to show them how you personally see this typeface being used. Hit Cmd+K to access the Preference window and go to the Grids tab. Hit Cmd+K to access the Preference window and go to the Units and Increments tab. Open your document and go File > Print Booklet. Click on the Print Settings... button at the bottom of the window. Click on the Printer… button at the bottom of the window. Select printer 124 (recomended by IT). Check the Preview option on the Print Booklet Window. If everything looks fine, click Print. Complete your portfolio, export a pdf, and sent it to me via email. The postcards on the Portfolio sample are my own designs and are only there to give you an idea of how much you can do with only a few letters. I expect you to come up with your own designs. Character Set Composition: Design a composition showing all the letters that you have digitized. Typography I Composition: Design a composition using the letters that make up the words Typography I.
Majuscule Composition: Design a composition using only an uppercase letter. Minuscule Composition: Design a composition using only a lowercase letter. Typographic Detail 1: Design a composition showing off a detail of an uppercase letter. Typographic Detail 2: Design a composition showing off a detail of a lowercase letter. Book Cover 1: Design a book cover using the letters from your revival typeface. Book Cover 2: Design a book cover using the letters from your revival typeface. Download the template in the "Download" section. Design you postcards on each of the Artboards. Make sure your type is not stretched. Make sure your scans are at 300dpi and your work is not accidentally cropped. Make sure your comments are set in Minion Pro 9/12pt. Your character panel should look like the image below. A printed and digital submission (pdf via email) of your completed portfolio. The four videos below show the process behind some notable type revivals. The reason for going back to the original source is because as technology changes, things get lost in translation. Studying the original material allows the designer to write a more complete history of how a particular typeface evolved and how it can improve. The teams behind each case study, not only seek to uncover the intentions behind the designs but also to expand on it and make it useful for the needs of contemporary typography. These two definitions from John Downer's essay Call It What It Is help shed a light on the fact a revival is oftentimes also a homage, and good revivals aim to improve and not merely copy. Closely based on historical models (metal type, hand-cut punches, etc.) for commercial or noncommercial purposes, with the right amount of historic preservation and sensitivity to the virtues of the original being kept in focus-all with a solid grounding in type scholarship behind the effort, too. Loosely based on historical styles and/or specific models, usually with admiration and respect for the obvious merits of the antecedents - but with more artistic freedom to deviate from the originals and to add personal touches; taking liberties normally not taken with straight revivals. In case you're missing letters to complete the assignment, please check out the online archived material. It's not high-res but it will give you an idea of what the missing letters look like. ATF Type Catalog 1912, p. 349. ATF Type Catalog 1934, p. 22. Write a brief paragraph answering these questions and post as a comment on the blog. By now, you've most likely developed feelings and opinions towards Caslon or Bodoni. What are they? How does it feel seeing you name set on your own digital letterforms? What would you change (weight, width, contrast, etc) to make it feel more personal? Why? What's your favorite feature (typographic detail) of Caslon or Bodoni? Why? What was the most difficult aspect of this revival assignment and how did you make it through? Week 3 videos on the Lectures section. Caslon was designed by William Caslon in 1722. It was considered the first original English typeface and was used extensively throughout the British Empire in the early eighteen century. Benjamin Franklin used it extensively and in fact it was the font used to set both the Declaration of Independence and the U.S. Constitution. Bodoni was designed by Giambattisa Bodoni in 1798 and is generally considered a modern serif typeface. One of the earlier publications using Bodoni was Dante’s La Vita Nuova in 1925. Download and complete either the Bodoni_Words_Template.ai or Caslon_Words_Template.ai worksheet. For Caslon, typeset the words stylistic, nittily, and instils. What was the easiest and hardest thing about this assignment? Talk about your process/experience of digitizing your lettering piece. What was the hardest and easiest letter (or part of a letter) to draw? Why? A printout of the completed BodoniBold Revival_Template.ai or CaslonHeavy Revival_Template.ai worksheet. A printout of the completed Bodoni_Words_Template.ai or Caslon_Words_Template.ai worksheet. Your revised TypeCooker Lettering pieces. Get familiar with the class Shared Drive. For more information see the Alerts page. Gerrit Noordzij describes very well the differences in the interaction of the forms with their counterforms. Also check out the rest of the Week 2 videos in the Lectures section. Submit your Garamond g's from Week 1 HW. If you didn't finish coloring, have it colored in black (pencil or marker, just make it as dark as possible) for next class. Complete 3 TypeCooker worksheets at the Easy Level. Translation Contrast: The contrast produced by a broad nib pen. Expansion Contrast: The contrast produced by a flexible or pointed nib pen. Transitional Contrast: A historical mix of broad nib and pointed nib influences. Please explain how you applied each contrast to your lettering pieces. Using proper terminology, talk about the typographic details that make each lettering piece have translation contrast, expansion contrast, transitional contrast. Which contrast type was the most difficult and the easiest to work with? Why? What was the most challenging parameter? Why? If you had to change one parameter, which one would it be? Why? Scan, upload, print, and pin your 3 lettering pieces to the board for critique at the beginning of the next class. Post your writings on the comments section and be ready to present your 3 lettering pieces at the beginning of next class. *If you missed the first class, check out the Alerts section. Read the following sections: Anatomy, Size, Scale, Type Classification, and Type Families. Week 1 videos on the Lectures section. Draw a Garamond lowercase g from the printout on a tabloid size 11" × 17" piece of paper. The drawing must be as large as the piece of paper and colored black. Make the letterform as dark as possible. You can achieve this by using, pencils, markers, etc. You must only draw from the small sample provided in class. Tracing is prohibited. Try to get it as close as you can to the original. After that, draw your own idealized version of a Garamond lowercase g. Change all the characteristics that you feel could be different or ‘better’ than the original design on the printout. What things did you learn or notice about the Garamond g? Was it difficult or easy to scale the drawing? Why do think that is? What changes did you make on your version of the g (list them out)? Why did you make those changes? Pin both of your 11x17in drawings side by side (original on the left, revised drawing on the right) and be ready to read your paragraph(answers) to the class. Bring all materials from the syllabus, especially tracing paper, kneaded eraser, and pencils. Please follow these links to access the homework assignments for each week. The non-numeric links are for (S) Syllabus, (L) Lectures, (R) Readings, (?) Questionnaire, and (!) Alerts. Read the following sections for Week 2: Anatomy, Size, Scale, Type Classification, and Type Families. Read the following sections for Week 3: Superfamilies, Caps and Small Caps, Mixing Typefaces. This is a list collecting the video lecture assignments for this class. You remember Comic Sans. You know, that irreverent, off-kilter font that came pre-programmed on 90s versions of Microsoft Word? In fact, you probably have very strong feelings about that font. Here's the story behind the most polarizing font ever made. House Industries has been producing their premier league retro design and their true love…Fonts! Fonts! Fonts! since 1993. House Industries’ lead letterer Ken Barber recently visited us in Berlin to give a workshop at our Gestalten Space, which explored the creative process of hand-lettering and the application of illustrative letterforms in contemporary graphic design. We took this chance to interview him on Gestalten.tv where he talks about the necessity of specialization and the fine lines between lettering, typography, and font design. We've sold out of their House monograph but are obviously huge fans and have a range of House Industries items at Gestalten Space, and available through our online shop, shop.gestalten.com. Watch our complete line-up of video interviews on gestalten.tv. A quick recording of sketching letterforms from the inside out. Postpone drawing the actual outline until you have an idea where it is. Just drawing any line isn't going to make it the right one. Better to ignore drawing the contour altogether and focus on proportion, contrast, weight, the white shapes as well as the black shape. The pen keeps the same amplitude and direction. Thus it performs similar to a broad nib pen and the contrast follows easily. Modulating the amplitude (shown later on) simulates the expansion of the flexible nib pen. This is by no means intended as an example of great lettering. These particular letters would benefit from a dab of white paint and perhaps an iteration or two on tracing paper. But it shows how to get started. 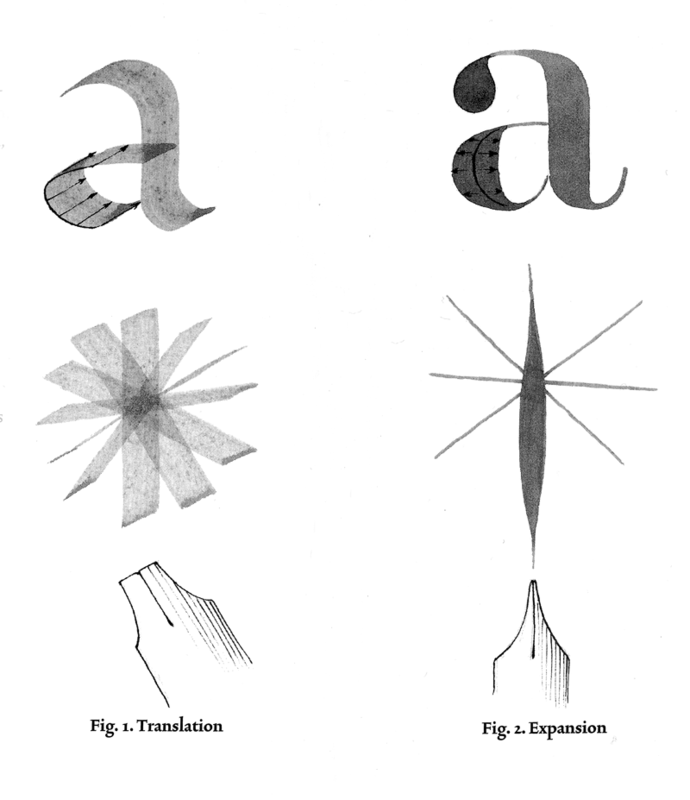 Similar to the sketching techniques shown by David Gates in Lettering for Reproduction. (Full English subtitles are available for this talk -- click the CC button in the bottom right of your screen to turn subtitles on.) Look at the letters around you: on street signs, stores, restaurant menus, the covers of books. Join Designer Mark Caneso on Adobe Live as he explores the limits of letterforms! This week Mark will create hand lettering illustrations that push the boundaries of size, shape and orientation in Illustrator CC. Mark Caneso is a designer living and working in Austin, Texas where he runs pprwrk studio, his independent graphic & typographic design endeavor. Join Lettering Artist and Designer Ryan Hamrick on Adobe Live as he designs and hand letters a quote for posters and t-shirts. This week, Ryan will teach you his entire process! Ryan is an independent lettering artist and designer based in Austin, TX. Join Designer & Illustrator Sindy Ethel on Adobe Live as she hand letters in Illustrator and Photoshop CC. In this three part series Sindy will illustrate the same word, transforming it with unique effects & treatments on each day! Sindy is an Interactive Designer living and working in New York City. Pick up a book, magazine or screen, and more than likely you'll come across some typography designed by Matthew Carter. In this charming talk, the man behind typefaces such as Verdana, Georgia and Bell Centennial (designed just for phone books - remember them? ), takes us on a spin through a career focused on the very last pixel of each letter of a font. Neue Kabel brings back the liveliness of the original's strikingly quirky characters, while adding in the long-lost italics and missing glyphs needed for it to address a wide range of editorial and branding purposes. Interviewed at his home in New York City, Dan Rhatigan discusses the importance of typography to today's culture and to him, personally. Learn more about Monotype at monotype.com. Follow Monotype on Twitter @Monotype and on Instagram @bymonotype. About this presentation As one of the world’s leading typeface designers, and this year's 99U Alva Award winner, Tobias Frere-Jones believes that the best way to learn a new skill is to "break things down deliberately” to understand how it’s really done. In this talk, we learn to see the beauty in taking risks. Frere-Jones explains that in order to do our best creative work, we must not just permit moments of confusion, but actually go chase them. “When trying to figure out a problem, pause for minute, and see if you can make it worse,” he says. “A structure can really describe itself as it falls apart.” About Tobias Frere-Jones Over the past 25 years, Tobias Frere-Jones has established himself as one of the world’s leading typeface designers, creating some of the most widely-used typefaces, including Interstate, Poynter Oldstyle, Whitney, Gotham, Surveyor, Tungsten, and Retina. Tobias received a BFA in Graphic Design from the Rhode Island School of Design in 1992. He joined the faculty of the Yale University School of Art in 1996 and has lectured throughout the United States, Europe, and Australia. His work is in the permanent collections of the Victoria & Albert Museum in London and the Museum of Modern Art in New York. In 2006, The Royal Academy of Visual Arts in The Hague awarded him the Gerrit Noordzij Prijs for his contributions to typographic design, writing, and education. In 2013 he received the AIGA Medal in recognition of exceptional achievements in the field of design.